Speaking as a former fighter and current boxing coach, I can say without question that neck strength is imperative for anyone involved in a contact sport. Unfortunately, many athletes tend to ignore neck training until there’s a problem. That is a mistake. Rather than waiting to react to problem, it’s best to be proactive regarding neck development. Long time readers of the site have surely heard me discuss neck training before. It’s something I take seriously and have written about in the past. More recently though, I demonstrated two neck bridging exercises to my Instagram page. Shortly after, my inbox was flooded with questions. With that in mind, I will use this entry to discuss those exercises, while also offering some additional options. 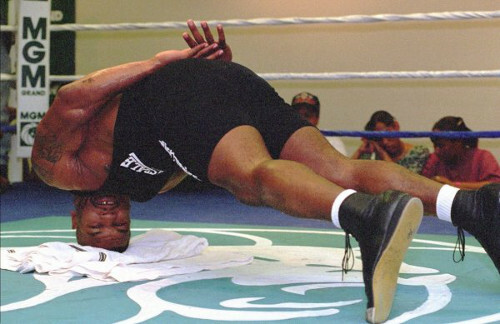 I grew up watching Mike Tyson perform a variety of neck bridging exercises (ex. see here). As an ambitious, young fighter, I naturally copied Tyson and began performing the same exercises. Over 25 years later, I’m still bridging, and my neck feels as healthy and strong as ever. Two variations that I often include can be seen below. In the second video, I’ve added a piece of foam underneath my head (a towel could also be used). Adding foam or a towel will be more comfortable, particularly for those who are new to bridging. You may also wish to start from the knees to reduce difficulty while acclimating yourself to these movements. Whenever I demonstrate bridging variations, it is all but guaranteed that someone will ask about the safety of these exercises. My response is always the same. Bridging is safe for those who possess the necessary strength and flexibility required to perform the movements. With that in mind, bridging is not an exercise that a beginner should perform without first developing the neck with less strenuous options. Resistance bands are one of the better ways to begin training the neck. All that you’ll need is a resistance band and Velcro strip to attach the band to your head. As for band resistance, a small or medium band will typically suffice for neck training. It is unlikely that you will outgrow either, as you can always add manual resistance by pulling down on the band when performing the exercise. The Velcro strip that I use is 30 inches long. It is 2 inches wide and rated as industrial strength. An image of the setup can be seen here. A demonstration of band resisted neck training can be seen below. Manual resistance from yourself or a partner is also an option for neck training. As a coach, I typically use a towel to provide resistance in this fashion. The fighter will rest his head off the end of the ring (or a bench). I will then provide resistance by pulling down on a towel that is draped around the fighter’s head. We will work in four directions (facing up, facing down, and each side). Another option for neck training is to use a weighted neck strengthener similar to what Gennady Golovkin can be seen using below. With the neck strengthener, you can work facing up, facing down, and each side. Another option for neck training is to work with a neck harness . 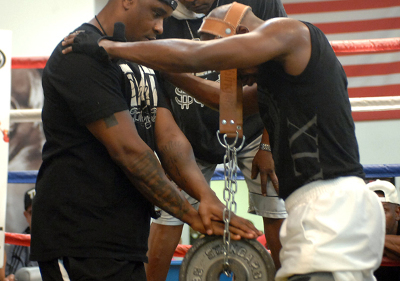 A neck harness can be used by beginners and advanced athletes as you can set the load specific to your ability. Beginners should start light and progress gradually. As for neck training frequency, two or three brief neck sessions per week will be adequate in most cases. You don’t need a lot of time to strengthen the neck. Just be sure to gradually ease into neck training if you haven’t done so before. To conclude, listen to George Chuvalo reiterate the importance of the neck. Chuvalo had one of the best chins ever. And while some of that was natural, he also made a point to develop his neck. It certainly helped as he was never knocked down in over 90 professional fights. 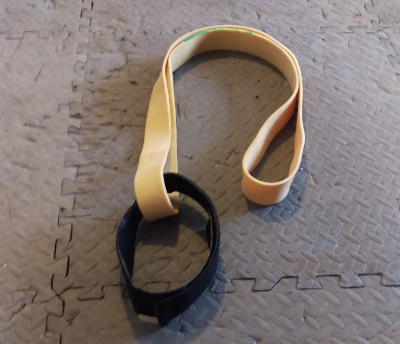 The post Neck Training Options appeared first on RossTraining.com.